In this healthy update of the Korean classic bibimbap, black-eyed peas are cooked with garlic, ginger, and red pepper and served with kale. I’m seven days late in saying this, but Happy New Year! Coincidentally, I’m 2 days early in wishing myself a Happy Blogging Anniversary. That’s right, on January 9 this blog will be 7 years old. I wish I had something profound to say about that, but frankly, I ran out of wise words on my third anniversary! Everything I wrote then still applies, and I am still thankful to all of you who read this blog for giving me an audience for my low-fat (and often off-beat) concoctions. As you probably know, I like to start off every year with the traditional meal of black-eyed peas and greens. However, I don’t feel compelled in any way to make either the peas or the greens in the traditional Southern way. Just take a look at my last post, a round-up of some of my favorite New Years recipes, and you’ll see that I’m all over the culinary map. This year I was inspired by a visit to The Wandering Buddha, a wonderful vegan Korean restaurant that my family and I visited while in New Orleans for Christmas. The sweet and spicy flavors of the two appetizers, three entrees, and three desserts that the three of us shared (we pigged out) reminded me why I like Korean food so much. So for this year’s black-eyed peas and greens, I went back to an old favorite Korean recipe, bibimbap. It is, to my mind, the prototype for all those “rice bowls” you can find in vegetarian restaurants–lots of tasty vegetables with a protein served on top of rice, drizzled with a spicy sauce. For non-vegans, the protein is usually beef and a fried egg, but I’ve always substituted either baked tofu or seasoned edamame. Black-eyed peas are not a traditional food in Korea, but I thought they’d taste great seasoned with garlic and ginger and a little Korean pepper flakes. And I was right! I rounded out the bowl with a favorite soybean sprout salad; this time, I reduced the soy sauce, sugar, and sesame oil by two thirds, and it came out much lighter on the sodium, fat, and sugar but still flavorful. Note: Though I mention a couple of special Korean ingredients, this recipe can be made with ingredients commonly found in almost any grocery store. If you’re interested in trying more Korean flavors, I recommend starting out with gochuchang (also spelled gochujang and kochuchang), the spicy pepper paste that has a flavor that’s hard to replace. You might also want to try gochugaru, Korean red pepper flakes, which are not as hot as crushed red pepper and have a deeper, smokey flavor. Both can be found in Korean grocery stores and online. Similar to bibimbap, this dish is a collection of separately-prepared ingredients served over rice. While it’s delicious with just the black-eyed peas and kale, I suggest adding a third component, such as the bean sprouts salad, shown, or Korean-Style Cucumber Salad. Pre-Cook the Blackeyed Peas: Combine the black-eyed peas, 5 cups water, 1 tbsp. ginger, 1 tbsp. garlic, and 1/2 tsp. salt in a pressure cooker or large pot. For pressure cooking, seal the cooker and bring to high pressure. Cook at high pressure for 10 minutes; then allow the pressure to come down naturally for 10 minutes before releasing the pressure. For regular cooking, use 6 cups of water. Cover and simmer until peas are tender (60-90 minutes), adding more water if necessary. Drain the cooked peas, reserving 1 cup of liquid. Heat 2 tablespoons of water in a medium-sized non-stick saucepan. Add the 2 teaspoons chopped ginger root and 2 cloves of garlic. Cook for 2 minutes. Add the drained peas, 1/3 cup of their cooking liquid, 1 tbsp. soy sauce (or tamari), and red pepper to taste. Simmer uncovered for 20-30 minutes, as you prepare the kale. Add additional cooking liquid if the peas get too dry. Kale: Heat a deep, non-stick skillet. Add the chopped onion and cook until it begins to brown, adding a little water as necessary to prevent sticking. Add the red bell pepper and garlic and cook for another minute. Stir in the kale and 1/4 cup water and quickly cover. Steam until the kale is tender but still bright green, 3-6 minutes. Remove from heat and stir in the soy sauce (tamari). Place a serving of rice into each bowl. Arrange the black-eyed peas on one side of the rice and kale on the other. Serve with hot sauce, such as Sriracha or the Gochuchang sauce in the notes below. I served this with a simple hot sauce based on Korean red pepper paste (gochuchang). Mix 1 1/2 tbsp. gochuchang, 1 1/2 tbsp. hot water, 1 tsp. sugar, and 1/4 teaspoon sesame oil in a small bowl. This makes a lightly spicy sauce that most people will not find too hot. Easy Hint: You can use 2 cans of black-eyed peas, rinsed and drained, instead of cooking dried peas. Simply begin with step 2, use water instead of cooking liquid, and increase the amounts of ginger and garlic, as desired. Gluten-Free and Soy-Free? Make this using coconut aminos instead of soy sauce. Without rice, this bowl is zero points on the Weight Watchers Freestyle program. Thank you for everything you do!! For the vegan community and for everybody else who just wants to eat healthier. I have been reading your blog since 2008, when my husband and I became vegan and have made quite a few of your recipes. And although I don’t comment often, I still appreciate your posts that continuously inspire me to stick with healthier foods. Thank you so much for being a long-term reader, Lisa! I appreciate your coming out of hiding and commenting! Happy Anniversary! Love your site! Btw, Franchia restaurant in NYC also makes a great Bimibap! I live in LA, so I’m lucky that I have easy access to Korean markets. I love to cook with gochujang, but hate the icky ingredients in some brands. (Most Korean products are ambiguous at best with their nutrition labels! I’ve been lectured for years by my Korean mother -.-) So I make my own using organic miso (the Japanese kind), Korean chili flakes and sucanat (or stevia). I’ve been doing it for years and it works AWESOME. I am so excited about this recipe! It just looks great and can easily be made completely soy free. It’s a wonderful option for a bowl that would normally feature more soy. You know how much I love black-eyed peas. The flavor combinations are inpsired. I will definitely be trying this one once I stock up again on dried black-eyed peas! And it’s a good excuse to buy some mung bean sprouts and use them all up at once. Awesome. The photos are gorgeous. Maybe I shouldn’t be looking at them so close to lunch! Maria, I think it was you who turned me on to coconut aminos. I finally thought to look at them when I was in Whole Foods in New Orleans over Christmas. I’m so glad that there’s a soy-free substitution for soy sauce now! You’re welcome, Susan. Yes! Me too! And they just happen to be lower in sodium than tamari. I like the delicate flavor a lot. Thanks for posting them as an option in the recipe! I love Wandering Buddha! I am going to try this recipe tonight. Oh, I love Wandering Budda! They delivered to our rental apartment when we got into NOLA late at night after a long day of traveling. It was so good! I will be making this recipe this week as I have been having a hankering for some black-eyed peas! Happy New Year to you too! I admit I didn’t go out of my way to eat black eyed peas on January 1st because I never came across a recipe that really appealed to me – had I seen this, I would have been all over it! I made this for dinner tonight and it is outstanding! Thank you for sharing this recipe and for all your hard work blogging! Made this last night. Was delicious. Thank you, Susan! This was exactly the kind of thing I was looking for. that pic…made me want to eat the screen…this looks so yummy! Luckily I have an Asian market near me to get these things, but the only problem is some of the products aren’t in English and the employees don’t speak english. Oh my god this sounds so good! 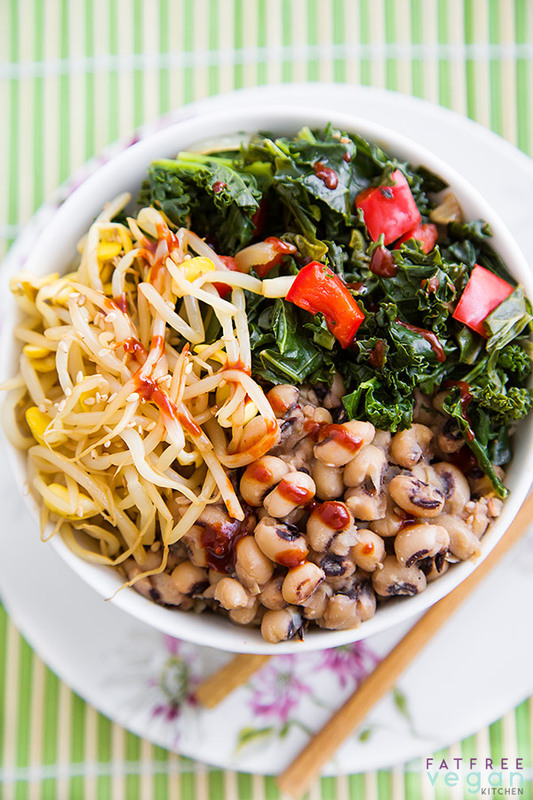 Beans, Rice and Kale…three of my firm favourites in the one bowl. Love it! I would like to try this recipe, my problem is I am on a candida cleanse, which means I can’t include soya, any liqiud aminos or tamari in this recipe, do you have any other suggestions? I would just add a little salt. Happy Anniversary! I know every time I need to get back on track and get inspired to eat healthy food, your blog is always one of my first resources… and I come back here more often than anywhere else! Thank you for the great recipes and advice. Are you from New Orleans? I feel like you get the pallet of this city so well (not an easy feat as far as healthy food goes)! I love sharing your recipes, they are a huge hit down here. I am linking your blog for our 28 Day clean eating challenge newsletter again! Thank you so much for your fantastic recipes, they are always amazing! Oh, you make me long for the Wandering Buddha! We went there twice for dinner while we visited New Orleans in March. It was hands-down the best food we had in the entire city. 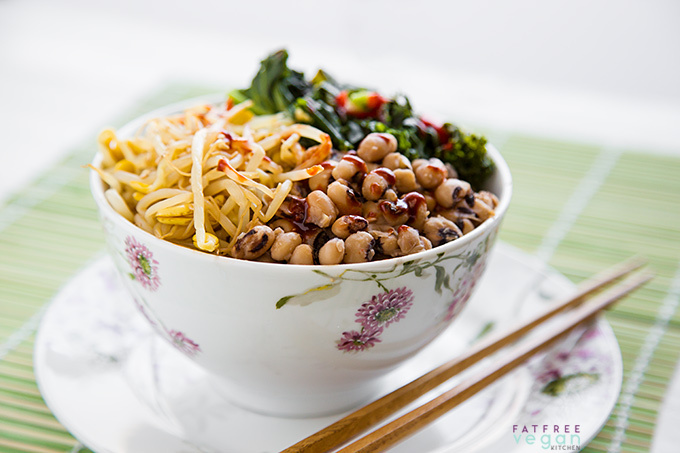 Fixed your Korean Inspired Black-eyed Peas and Kale dish last nite- Amazingly Delicious! I did not have any Kale on hand so I used cabbage and it was yummy. I also used only the broth from the black eyed pea cooking for any of the liquid called for. I also used 4 cups of vegey broth plus 2 cups water for the 6 cups of water called for to cook the black-eyed peas. I really love your site- it is my go-to site for Vegan recipes. Mary McDougall and Ann Esselstyn are my other 2 favorite recipe sources. I’m a longtime reader of your blog and have never posted a comment before now, but just wanted to say congratulations on being interviewed for the New York Times article on going vegan. Wonderful recipe! I made this today, and it turned out great! I had to use soybeans in place of black-eyed peas, but I had everything else available. Everyone loved it. Hi Susan, what a great Korean fusion idea. I have navy beans on the stove and will try this with the next round. As it turns out I have a kilo of soybean sprouts and a cucumber on my counter waiting for Korean transformation today 🙂 but my family will want to have split pea + navy bean soup (the navy beans are a reasonable texture sub for bacon). Am a Korean food fanatic so thanks for all Korean veg ideas. BTW in Korean the sauce is spelled gochujang, so that might be the most popular spelling. If you’re curious look at the package and find the somewhat X-shaped letters with a line on top: the first is with a vertical dash that indicates aspiration (‘ch’ like church) and the second has no dash above it, so it’s the same base letter without aspiration, a J sound like judge. Thought you might like to know if you like Koreana as much as I do. I made this last night and my boyfriend (non-vegan) said it was like eating at a high end restaurant! So delicious! OMG…we made these last night and they were the best black eyed peas I have ever had…and my Grammy is from the South! Thank you for a flavorful, healthy, and vegan alternative! I am so gonna do this recipe. May I share it on my youtube channel? I just found this on Pinterest. 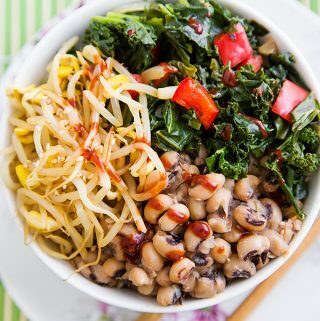 It’s never too late after the New Year for black-eyed peas, and kale is always on my list. This dish looks healthy and fantastic. Hi Susan! This recipe looks divine and I plan on making this tonight. Just wanted some clarification – I don’t have a pressure cooker, so am going to use the regular cooking method. It says to use 6 cups of water and simmer until done.. Am I right to assume that you se the same seasonings with the 6 cups of water as you would cook in the pressure cooker? It doesn’t say to use the 6 cups of water PLUS the seasonings you mentioned in the pressure cooker step. Cassie, what I was trying to say was use 6 cups of water instead of 5. Everything else, including the seasonings, remains the same when making it in a regular pot. Hope you enjoy it! Thank you so much for the clarification! I thought it would be the same, just the increase in water, but wanted to make sure 🙂 I’m so happy to find an oil-free korean inspired vegan recipe! Looking forward to this tonight! I made this today as my New Years good luck dish, and it was wonderful. I added a little extra soy sauce on the top. YUM! Made this today. Amazingly delicious. Not previously a big fan of black eyed peas, but I loved this dish. Made this for dinner tonight– really outstanding. Thanks for all of your creative and delicious recipes! I forgot to buy sprouts so I made a crunchy carrot salad with ginger dressing, worked perfectly. This is so delicious! Absolutely loved the combination of flavors. And so healthy. The perfect thing to eat after enjoying all manner of sweets and fats over the holidays. I just happened on your blog looking for a black-eyed pea recipe. Can’t wait to browse around and see what other yumminess you have. Thank you so much! Thanks for the Korean Inspired Black Eyed Peas and Kale Bowl. I love Bibimbap and this was a tasty stand in. The black eyed peas still had their smoky flavor and absorbed the ginger and garlic the kale was yummy and the mung sprouts (have loved these since my cousin’s Korean wife made them for me) and cucumber were wonderful additions, each with their own flavors. Yes, there was a bit extra prep, but it was surely worth it!